Being “software about nothing” isn’t easy. Max has for years been a favored choice of musicians and artists wanting to make their own tools for their work. But it’s been on a journey over more recent years to make that environment ever more accessible to a wider audience of people. The aim: for beginners and advanced users alike, work faster, producing tools that work better. Okay, those are easy goals to set – a bit like all of us declaring we’re going to “get in better shape” in a few weeks from now on New Year’s Eve. But Max 7 somehow brings together a range of plotlines from years of development and evolution. This is very quickly looking like the visual toolkit for media that Max has always longed to be. Patch faster and prettier with a new UI, styles, new browser, and loads of shortcuts. Elastic, pitch/tempo-independent audio everywhere, syncable everywhere. Loads of pitch correction and harmonization and pitch effects, straight out of the box. Use Max for Live patches directly – even without a copy of Ableton. Use video and audio media directly, without having to make your own player. Use VST, AU plug-ins seamlessly, plus Max for Live patches – even without a copy of Ableton. Make video and 3D patches more quickly, with physics and easy playback, all taking advantage of hardware acceleration on your GPU. There’s a new UI. You’ll notice this first – gray toolbars ring the window. Somehow, they do so without looking drab. Objects are on the top, where they’ve been since the beginning, but now media files (like audio) are on the left, view options are on the bottom, and the inspector and help and other contextual information is on the right. (That’s all customizable, but so far everyone I’ve talked to has been happy with the default.) Max also recalls your work environment, so you can pick up where you left off – and it recovers from crashes, too. My favorite feature: you can theme UIs with consistent styles. You can browse and collect files easily. Clearly inspired by browsers like the one in Ableton Live, there’s a file browser for quick access to your content, and you can collect files in folders and the like from anywhere and drop them in. This isn’t the first version of Max with such a feature, but it’s the first one that makes managing files effortless. And you can tag and search in detail. Reuse your patches as snippets. Got a set of objects you reuse a lot – like, for instance, one that plays back audio or manages a list? Select it, save it as a snippet, and then find it in that new browser. There are lots of examples snippets, too, interestingly pulled directly from the Max help documentation – so no more will you need to head to the help documentation and recreate what’s there. Elastic audio – manipulate audio in pitch and time, separately. The Max and Pd family has been able to manipulate pitch and audio independently as long as it has had audio capabilities – provided you do the patching to make that work yourself. What’s changed is that it’s built in. Audio objects now support these features out of the box without patching. There’s a new higher-quality “stretch~” object that sounds the way we expect software to sound out of the box. And all of this interacts with a global transport. This is of course useful to those making Max for Live creations for Ableton Live, as it means you can build in audio manipulation and everything will sync to a Live set. But it means something else: you might wind up building your own performance tool without even touching Ableton Live. There’s a bunch of modular stuff included. Can’t afford a big rack of modulars? No room for hardware and cables? The Beap modules are now included, which let you combine software modules in much the same way you would physical modules. Then if you do use hardware modulars, you can output the same signal via a compatible audio interface and control that. Use media. Media files now have their own players, with clip triggering and playlist creation. Making a VJ tool, for instance, should now be stunningly easy, and working with audio playback (in combination with elastic audio) ridiculously straightforward. Use Max for Live devices directly. No copy-and-paste – you can now open Max for Live patches even without owning a copy of Ableton Live. That’s another reason patchers may wind up just building their own performance environment. 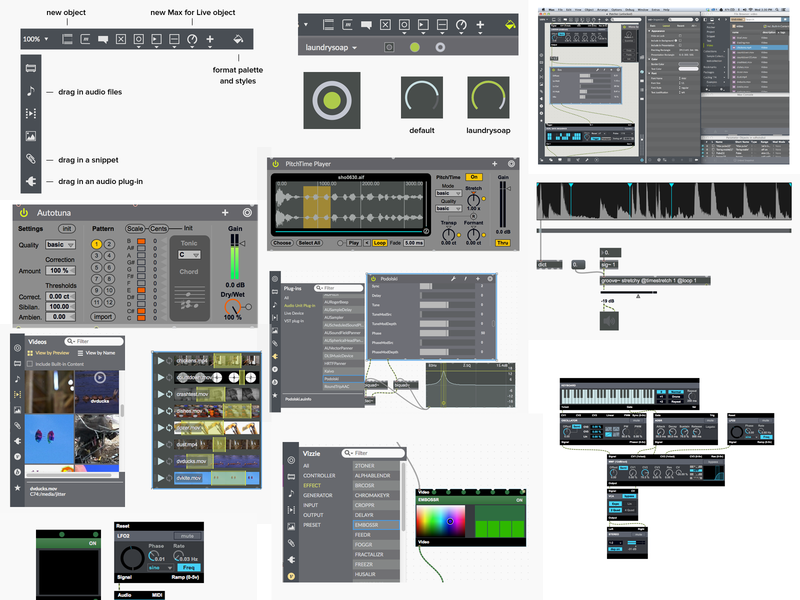 To get you started, a bunch of classic Max for Live devices are included (like Pluggo), plus a whole mess of pitch shifters and players, vocoders, and elastic audio instrument/effects. AutoTune the patch. retune~ is an intonation / harmonization object – what’s known colloquially to the rest of the world as “AutoTuning” (apologies to Antares for abusing their trademark). T-Pain, Max/MSP edition? There’s also a correction/harmonization device for Max for Live. Use the Web. You can now embed the open source Chromium browser inside your patches (the WebKit-based embedded browser engine that’s used in Google Chrome), and use data from the Internet. This is the version of Max visual users have been waiting for. I’ve saved some of the best for last. Jitter has long been the somewhat ugly stepsister of the audio stuff in Max, and it’s lately been showing its age. No more. Max 7 looks like it’s worth the wait. This is at last a version of Max that’s fully hardware-accelerated for video and easy to use. A single jit.world object consolidates the stuff you need to output to the display – complete with physics and OpenGL 3D/texture support. Video input and output syncs automatically, rather than requiring separate metro objects. Make your own objects in gen.
Use a massively-enhanced collection of live video modules (which interface with those modular objects, too). Patch faster. Keyboard shortcuts quickly create and connect objects (at last! ), you can zoom around the cursor with the ‘z’ key, and quickly apply transforms to patches. No more runtime. The unlicensed version of Max opens patches and edits them; it just doesn’t save. Available now. 30-day free trial, upgrades are US$149, and you can now subscribe for $9.99 a month. The only thing you’ll be waiting on for a little while is, unfortunately, full Ableton Live support; no timeline on when Ableton users will see Max 7. I know they’ll want it with all those elastic audio features. I don’t think there’s any doubt: Max is now the patching environment to beat, by far. Nothing else is anywhere close to this broad, and now nothing comes anywhere close to being this usable. That doesn’t mean I think other environments should try to be Max. For most music users, the big rivals remain Native Instruments’ Reaktor and Max’s own cousin Pd, and there’s still room for them. Reaktor may be a lot narrower than Max, but it’s also still a terrific tool if you just want to build an instrument or effect quickly. It also has some rather nice granular tools. It is looking long in the tooth, though, and I’d like to see Native Instruments treat this release more seriously. It’s hard to put work and time into Reaktor patching knowing that Native Instruments won’t provide you any sort of runtime to share your work – anyone wanting to use it has to go buy Reaktor or Komplete. And good as those instrument/effects tools are, Reaktor’s media management for samples is appallingly bad. In fact, until Reaktor fixes that area, it’s hard not to imagine some people jumping ship for Max – especially with built-in plug-in support. Pure Data (Pd) is a different animal. Max 7 is another reminder of why we need Pd. Even though both originally leapt from the mind of Miller Puckette, they’ve evolved into radically distinct beasts. It’s a bit like coming back to Galapagos Island after twenty years and finding one of your turtles has evolved into a space dragon while the other one became a washer/dryer. It isn’t just that Pd is free and open source software, it’s that it’s engineered in such a way that makes that an advantage. Pd is tiny, even as Max is huge. That makes Pd well-suited to embedding in apps and games, mobile and desktop, software and hardware, when Max can do nothing of the sort. Max 7 is also, however, a painful reminder that Pd needs a new UI. Maybe it should also be minimal (a Web-powered UI would sure make sense). But the time is now. (And a desktop Pd really wants plug-in hosting, but that’s another story.) My dream at the moment would certainly be that each becomes effortless enough to use that I can spend some proper quality time in both. There are, of course, many other ways to solve problems in code and patchers, so I won’t go into all of them. But there, we live in a wonderful time for DIY creative tools. It doesn’t have to be a time drain, it doesn’t have to painful. It turns out that software about nothing can be for more or less anyone. We’ll look more in detail at Max soon; I’ve got some interviews lined up for when I’m back around Berlin.